Same day crowns in Kansas City, Kansas - Kansas City Dental Professionals P.A. Cerec allows for the creation of beautiful all ceramic crowns in a single visit!! Do you recall a crown or crowns you’ve had made at your dentist’s office where a tooth was numbed and shaped, an impression was taken, a temporary crown was cemented and then you left the office? You had to return to the office in two or three weeks to have the crown fitted and cemented to the tooth. Did you have any problems or sensitivity with the temporary crown? 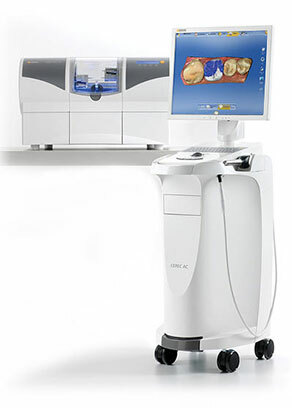 Unlike this traditional method, Cerec uses a combination of infrared imaging, computer CAD CAM design and a precise milling machine to help complete the entire process is about 2 hours from start to finish – all in one appointment! Why would you want a Cerec same day crown instead of a conventional one? Less time in the dental chair – half the number of appointments; fewer local anesthetic episodes. Many lab crowns have a metal substrate that porcelain is bonded to. Cerec crowns are all porcelain – this means lower chances of allergic or immune response to the material in the crown. Less chance for complications – most temporary restorations leak or have other discrepancies that can sometimes lead to increased sensitivity and this can even create the need for further treatment such as root canal therapy. When the crown is started and finished in one appointment, the tooth structure is better sealed off and protected at an earlier stage with the result that risk of complications and/or sensitivity can be lowered. Cerec is patient friendly! Once the design process begins, you are free to move about the office, make phone calls or even have additional dentistry such as a couple of fillings done – further shortening the number of visits you might need. There is a time frame of about 30 minutes in the middle of the appointment where the crown unit is being designed/fabricated and your presence is not needed unless you elect to have other needed treatment accomplished in that time slot. Fewer materials used – most materials in the process have a far lower negative impact on the environment. Fewer appointments mean fewer miles driven in your car for transportation. Fewer appointments mean fewer wasted disposable materials including paper products, syringes, plastic products, autoclave cycles, rubber gloves, masks and so on. An infrared camera takes images of the tooth after shaping and a CAD CAM computer program immediately downloads the images creating three-dimensional virtual models that can be viewed and manipulated on the computer monitor. The operator in the dental office then uses the program to design the crown that will replace the missing tooth structure. This usually takes about three to five minutes. Next a porcelain block is selected, is inserted into a milling machine and the software program sends a signal to the milling machine to create the design in porcelain. This takes about 13 to 18 minutes. Once completed, the crown is polished, glazed and placed in the oven for about 15 minutes. Then it is tried in the mouth, adjusted and bonded into place. The entire process takes about 2 hours and there is a period of about ½ hour for design and milling that can be used to accomplish other needed dental work. For more information on Same Day Crowns in the Kansas City area call Kansas City Kansas Dental Professionals at (913) 321-4385 today!